LEE, Mass. 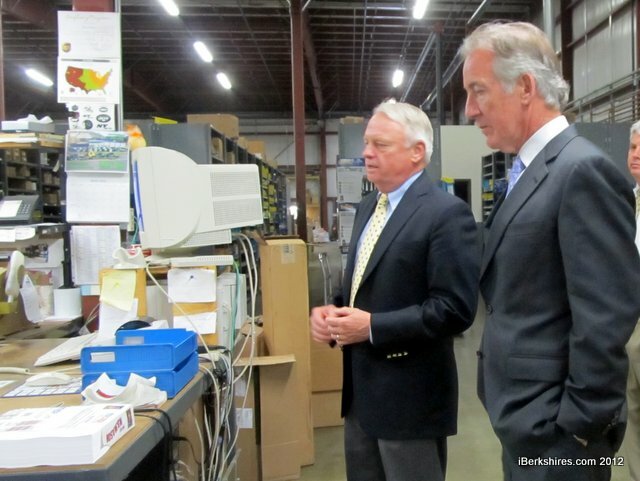 — U.S. Rep. Richard Neal continued what he calls a “listening tour” of the county’s businesses on Tuesday with stops at Patriot Armor and Ray Murray Inc. LLP. The recent economic recession took at toll on Ray Murray Inc. when new construction and remodeling slumped, owner Ray Murray said. The company specializes in reselling propane and natural gas equipment and heating and hearth equipment. Murray said there is a lot of changes happening in his industry. The country is becoming a net exporter of natural gas and propane is 100 percent produced in this country, he said. “We don’t have to buy them from people that don’t necessarily like us in the Middle East and other parts of the world. They’re also really clean compared to traditional oil products,” Murray said. Another change in the industry is an increase in conservation. Homeowners are using less and less energy, Murray said. Neal toured the warehouse, meeting many of the workers along the way. Ray Murray Inc. employs about 40 people in Berkshire County and about another 40 in two of the company’s other warehouses — one in Philadelphia and one in Flint, Mich.
“When we started the business in 1973, we had four employees and now we’re north of 70,” Murray said. The company was the first tenant of the Lee Business Park when it built its newest facility in 2001. Most of his business is done outside of the state, bringing the dollars into the county, Murray said. “These decisions going forward with growth is going to be based on the state of the American economy. Here today they are very interested in the alternative energy credits that I’ve worked hard on,” Neal said. The representative is currently representing the 2nd Mass District, and running for the 1st Mass because of redistricting. RMI was the second growing business that Neal toured. The first was Patriot Armor, which specializes on production of glass for the security industry. The company provides glass for embassies, armored cars, banks and other such uses. Patriot Armor was purchased by Tom Briggs just eight months ago after the holding company that owned it racked up debt and nearly drove it into the ground. Briggs was the lead vice president of sales and purchased Patriot Armor to keep his co-workers employed. “Tom stepped up to the plate and he saved 40 jobs in this area,” Ralph Tassone, general manager, said. Briggs told Neal that the company is struggling to getting out the debt left behind. The first few months were left picking up the pieces that were left behind by the holding company, he said. The company is focusing on building its relationship with customers first and is hoping keeping growth slow as it climbs out of debt. Tassone said the company also focuses on relationships here in the Berkshires. The security industry is a hidden gem of the Berkshire economy, he said. Patriot Armor sells glass to the local companies Armored Solutions, Photec and Lenco. “This is really a growth industry … The work that they do for the Defense Department, courthouse security — those are two items that come to mind — and coupled with the whole notion of what sophisticated glass work is going to mean for national security. It’s really widespread in its application,” Neal said.